Marks the date Haile Selassie I visited Jamaica in 1966. 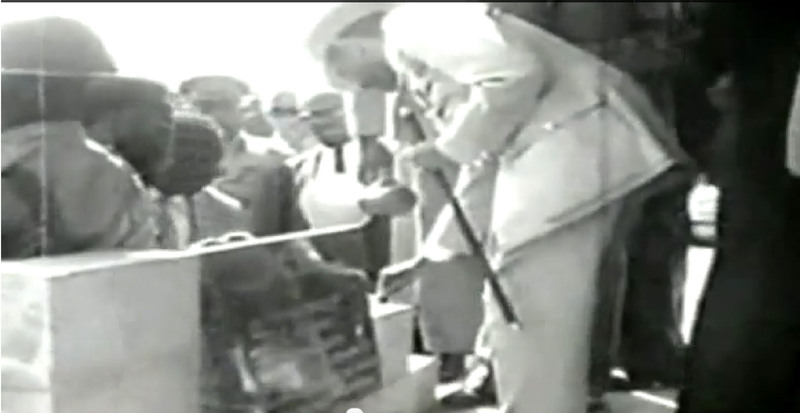 The visit was the only time the Emperor visited Jamaica. A Nyabingi session, inclusive of music, chanting and prayer is held to mark the occasion. 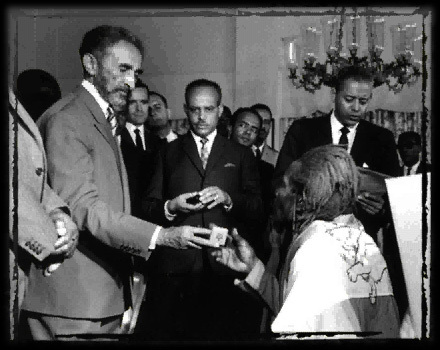 Haile Selassie had already met with several Rasta elders in Addis Ababa, and had allowed Rastafari and other people of African descent to settle on his personal land in Shashamane. 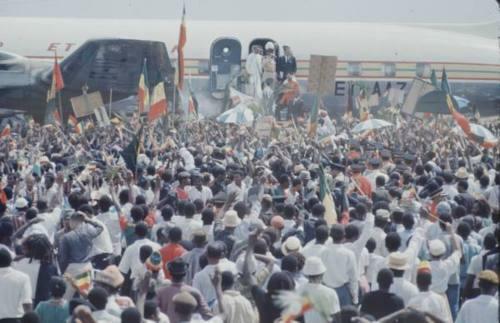 The door to the plane finally opened forty-five minutes later, close to 2:15 p.m., and His Imperial Majesty came to the top of the stairs to deplane. The crowd responded with a roar that “was louder than the sound of thunder rolling, louder even than an explosion” recalls Mitsy Seaga who accompanied her husband, Edward Seaga, the then Minister of Development and Welfare. Seaga himself remembers the event as awesome in every sense of the word. Mortimer Planno, A Ras Tafarian leader, and a Ethiopian World Federation member of Local 37 mounted the landing steps at the request of officials, bowed to the Emperor and also beseeched the crowd to be calm and let the Emperor pass. 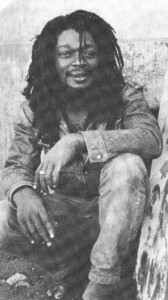 Mortimo Planno had been part of a Jamaican delegation, which included, Filmore Alveranga and Douglas Mack. Mr Cecil Gordon, the President of Local 19 and Dr L.C Leslie the former Mayor of Spanish Town who visited Africa and had been received by HIM Haile Selassie in Ethiopia in April 1961. With assistance from the military and the police, the Emperor, his daughter and the rest of his entourage were able to leave the airport. They were whisked away to a 5 p.m. civic reception at the National Stadium where another large, excited crowd awaited. 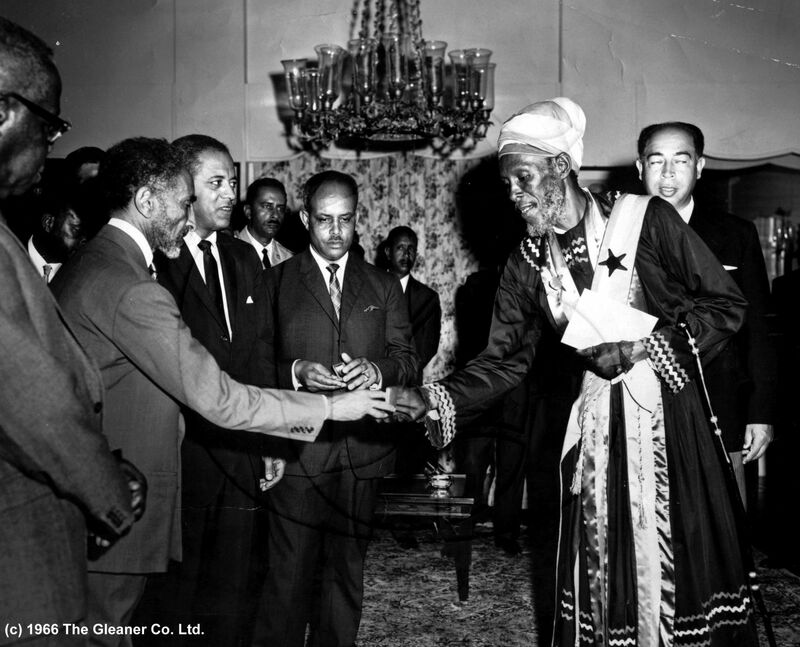 The Ethiopian and Jamaican National Anthems were played and the Emperor was presented with the keys to the city by then Commissioner of the Kingston and St. Andrew Corporation (KSAC), Mr. Eustace Bird. The Emperor was welcomed by acting Prime Minister, Sir Donald Sangster. 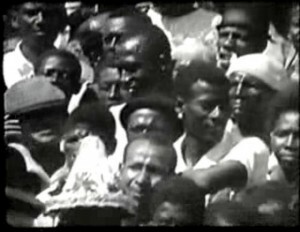 The Emperor replied in Amharic calling the visit the fulfilment of a lifelong desire, and thanking the people of Jamaica for their outpouring of affection. The ceremony was, however, marked my human rights protestors bearing large placards with anti-government slogans. 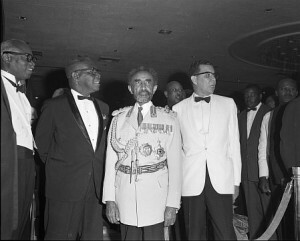 The Emperor later attended a state dinner at Kings House where extra police were placed on duty, in response to the enthusiasm of the people of Jamaica. On Saturday, April 23, the Emperor and his entourage embarked on a train trip to see the western side of the island. Crowds turned out to greet him along the eight-hour journey where stops were made at Denbigh, Williamsfield, Maggotty and Montpelier before ending in Montego Bay close to 4 p.m. A student from Glen Stuart Primary School was awarded a souvenir coin by the Emperor when he visited Maggotty, St. Elizabeth. 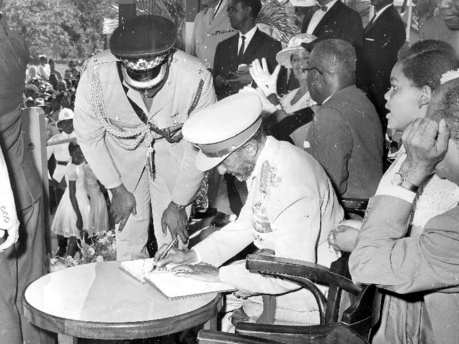 At around 4:15 p.m. the Emperor’s car came into view, in Montego Bay cheers from the crowd gathered to welcome the Emperor in a 30 minute civic reception in what was then called Charles Square (now known as Sam Sharpe Square). While in Jamaica the Emperor received many gifts including portraits, maps, scrolls and a sculpture presented to him the artist himself, Mallica ‘Kapo’ Reynolds. The Emperor, so touched by the gift, thanked Kapo in English, one of the few occasions in which he did not speak his native Amharic while in Jamaica. 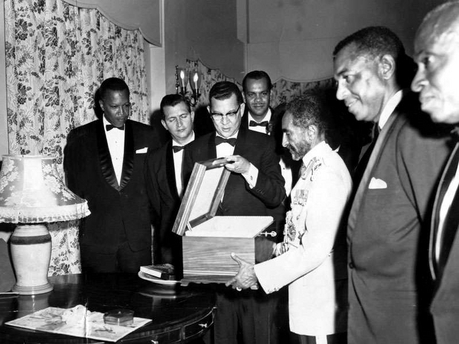 Selassie also gave many gifts including gold coins that bore his head, gold cigarette cases. 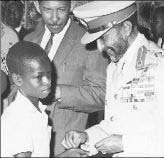 While on his way to Montego Bay, he stopped en route to the Spanish Town Railway Station and laid a stone for the Haile Selassie I Junior Secondary School. In response the Jamaican government announced the award of a scholarship for an Ethiopian tenable at the University of the West Indies. Emperor Selassie I left Jamaica on Sunday, April 24 at 9 a.m. for a state visit to Haiti after inspecting a guard of honour mounted by the First Battalion, the Jamaica Regiment. In contrast to his boisterous welcome, his departure was a sombre scene, with only a few hundred solemn-faced persons on hand to say farewell at the Montego Bay Airport. 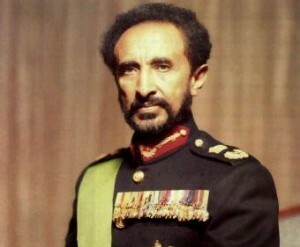 Haile Selassie I speech to the Jamaican parliament. The Jamaican people have a long glorious history. The Jamaican people have struggled to attain their independence and since independence the Jamaican people in an exemplary national unity have gone on to bring further abundance and progress to themselves. Because I know of the sentiments the people of Jamaica entertain foe the Ethiopian people, I have always wished to come and visit Jamaica. Now, thank God, this wish of mine has been fulfilled. Our relation with the Jamaican people, as I have said already, is not of present origin. 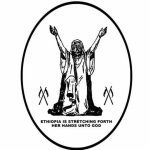 At a time when the Ethiopian people bore aggression – harsh aggression – the people of Jamaica showed their concern and sympathy to the Ethiopian people and have in this way provided us with encouragement regarding which the Ethiopian people shall be forever grateful. The relation, in a broader sense, between the people of Jamaica and the people of Ethiopia and Africa are deep and abiding. We have all struggled for independence and have achieved it now. Because we are people dedicated to the achievement of our independence, we have attained an objective that is the basis for continued mutual co-operation and goodwill. In addition to this there is a bond of gratitude, a bond of brotherhood. The people of Jamaica, by and large, have originated in Africa. This again gives us another basis upon which we can contract a healthy relation, a relation that is not only going to be useful to our respective peoples but a relation, because of the fundamental similarity between us that will in the long run contribute to a better maintenance of international peace and security. In addition to this both the people of Jamaica and the people of Ethiopia are dedicated to another cause, that is the cause of progress and prosperity. Here again the struggle we have to undergo, the difficulties we must all overcome, and the programmes we must adopt have much similarity. Thus I say the people of Jamaica and Ethiopia have much in common and these common factors can be used as the basis for even stronger relation between our two peoples. The people of African origin have immigrated to many parts of the world. Some of them have come to Jamaica; others to other parts of the world. But wherever they may be they have similar historical experiences and the problems that await them depends on sympathy, and this can be used by all of us as the basis for the establishment of greater cooperation which will be for our mutual benefit. 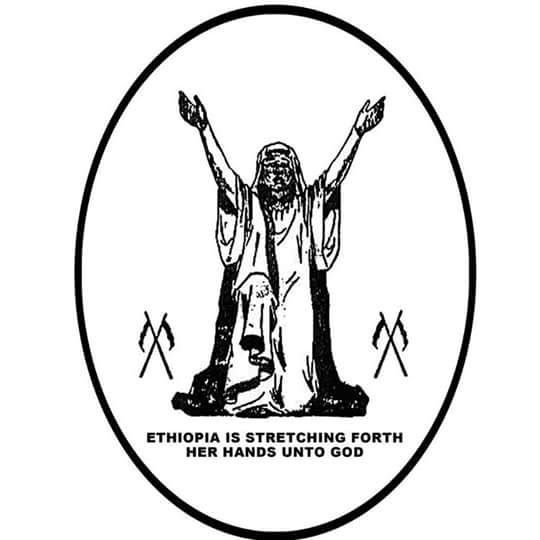 In addition to this I also believe that the peoples of Jamaica and Ethiopia have another important cause in common, that is the cause of international peace, for much more than means of warfare, the violation of peace somewhere, must be discouraged to prevent the utter devastation of the human race. We have as an important concern that there should not be a violation of international peace and security. In addition to this it is quite true that a country can achieve material progress alone. However, we know from the experiences of the past that international co-operation tends to quicken the pace for progress of individual countries. This is again another area for us to think about and see in what way we can further expand the relations between the peoples of Jamaica and Ethiopia. From another fundamental point of view this is why the organization of African Unity has been established. It is because the African continent, which comprises more than 250 million people, were it to remain divided among more than 30 states, their individual voices would not carry weight. 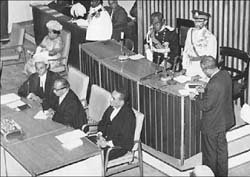 It is precisely why, since there is identity of interest, we have attempted to include Jamaica also, so that we can carry this weight in the councils of nations, and also through the process of co-operation and expanded economic relations we might be in a position to quicken the pace of development of the individual member countries of the Organization of African Unity. Because the African people are dedicated to the cause of the maintenance of peace, because the African people are determined that their should be that material progress for their people, and because the African people believe in the essential precepts of democracy, these are the foundations of the Organisation of African Unity. An organization that is based on such a solid foundation can only bring success to all its endeavours which will be for the interest and benefit of the African people, and perhaps also the interest of other peoples. We must remember that many states that today represent the major powers of the world were once weak, were once prey to other major forces. But, however, through the process of assimilation, through the process of the realization of fundamental national interests, and through the process of combination that they have achieved, they have become the major powers, the powers that are all-embracing. From the same point of view the peoples of Africa in Jamaica who have identical interests should be able to augment their energies for good by the process of the establishment of greater collaboration. Lastly, may God give wisdom and His blessings to the people of Jamaica. This entry was posted in Culture, Dates: Jan-Jun, History, Important Dates, Uncategorized and tagged E.W.F, History. Bookmark the permalink. wee love content like this so please doo keep it coming! 1) Ethiopians and Jamaicans are brothers/Sisters, the word Habesah and Habeses was used in the Amharic language. 3) Jamaica should unite with other countries especially small countries to ensure their future peace and security. Who are the Habesah or Habeses? the Abyssinian’s in Amharic are called Habesah. The Emperor stated that he recognized or knew that Habesah were in Jamaica. The word Habesah is related to the word Abyss the womb of mother earth, this is also related to the soul of trees. The roots of the tree reaches into the Abyss or the womb of the earth. Bes or Es or Eses means tree or the place of the tree’s meaning Streete. Another word related to Habesah is Ptah that means stone as in a mountain, this name is often seen as Peter aka Cepheus. The male mountain is Ptah, and the female mountain is Bes the Abyss the womb of the earth. Adam and Eve the pillars of the human race name is Ptah Eses.